Old Melodies ...: PSYCHEDELLIC GUITARS & MIND EXPANDERS ‎– Psychedellic-Guitars & What's Happening ? PSYCHEDELLIC GUITARS & MIND EXPANDERS ‎– Psychedellic-Guitars & What's Happening ? Making a mad dash to cash in on the burgeoning trend of psychedelia so fast they spelled "Psychedelic" wrong, these two albums pricelessly highlight a moment in '60s culture that came to be known later as the "exploito record." Even revolutionary producer Joe Meek made a habit of studying hit singles the moment they came out, just to record knock-off versions with lesser-known bands in an attempt to exploit the popularity of the original, or in some cases, trick the public into doling out their money for an inauthentic copycat of the real thing. In essence, Psychedellic Guitars/What's Happening? is doing the same thing. This collection packages together two obscure instrumental records from the era whose goofy titles and contrived themes make them prime exploito fodder. The nameless band on Psychedellic Guitars presents the more traditional of the two halves of this collection. Presumably overworked studio musicians instructed to make a trippy record, the compositions here are more rooted in early surf and instrumental rock forms than anything truly out there, but when they take liberties with the fuzz (as on the barely coherent fuzz bass segments of "Take a Trip") things get at least interesting, if not mind-altering. What's Happening? is credited to a band called the Mind Expanders, who employ more genuinely psychedelic tactics. Laying in heavy with Moog synthesizer tones atop pop rhythms gives the more upbeat numbers an almost popcorn-like feel. "Pictures at a Psychedelic Art Exhibition" apes classical composer Mussorgsky's "Pictures at an Exhibition" in a way part clever, part annoying with synth overload and spastic drumming. The Mind Expanders touch on the menacing side of things more so than the cartoonish soundtracks on Psychedellic Guitars. Barnyard sound effects, spooky Theremins, and brief sound-collage moments nod toward bad trips before dipping back into the good vibes. As was the case with most of these ultra-corny mood music albums, there's nothing essential on either of the two records presented here, but essential listening doesn't always equate to fun, which this collection offers up in goofy, cheesy, terrifically dated lots. "I will post this review for both volumes of Psychedelic Guitars. At the time I bought these discs there were no other reviews and just a brief, inaccurate description by Amazon. Since I grew up in the 60s and I'm a big fan of psychedelic music I chanced these against probably my better judgement. The first hint that things are amiss is the fact that no artists are mentioned. All songs on these discs were performed by anonymous studio musicians back in the 60s, hence the term "exploito" which Amazon uses without explanation. Back then the target audience wouldn't have been the kind of people that actually listened to psychedelic music, but probably adults of that time that wanted a little "hip" music or at least what they thought was hip in their music libraries. I owned an LP, called "The Corporation" similar to these back in the 60s so I've seen it before. The music mostly sounds like something you hear as background music in some drive in teen movie back then, maybe music in the "disco" as our stars smoked a littler reefer or were speeding in their cars or something. So be warned, I gave it three stars because I thought they were kind of fun, but not because there was any "serious" guitar on here. The volumes are each made of two seperate LPs that were released back then so the first half and second half have totally different sounds or approaches. 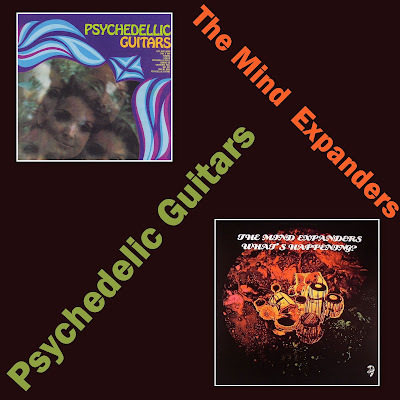 In the first volume, Psychedelic Guitars/Mind Expanders, the first half features instrumentals in a very tame hard rock/blues/soul vein with tame, brief guitar solos. The second half of this disc has the "farthest out" music on either disc. Picture the tripping scene from Easy Rider or something similar. This comes the closest to matching the Amazon description. The second volume is similarly divided. The first half is tame rock instrumentals. In this case the second half is cover versions of rock songs from back then: Psychotic Reaction, Shout and other hits. Interesting but not the originals. Psychedellic Guitars: 1) Let's Ride Again 2) Take A Trip 3) Flowers 4) Love In 5) Psychedellic Ripple 6) Coming On 7) Unchained Soul 8) Way Out 9) Take Me Back 10) Psychedellic Guitars . The Mind Expanders: 1) Love Syndrome 2) Theme From 3) Pictures At A Psychedelic Art Exhibition 4) Cul De Sac 5) Downtown Trip 6) Pulsation 7) A Night On Bald Mountain 8) Sensory Overload 9) Euphoria 10) Mandala. Yhanks for this one ! Much appreciated !